The wreaths were hung in the store fronts and the trees adorned with twinkling lights. The last of the trick-o-treaters dwindled back home awaiting the holiday delights! November 1st never fails to surprise me – within mere minutes, everywhere you go turns into a Christmas village. My personal favorite part about the Holidays apart from the weather finally being suitable to wear layers here in LA is the endless celebrations. Whether I’m attending Friendsgivings, Christmas parties with colleagues or simply snazzing up for a date night – Express is my one stop shop! 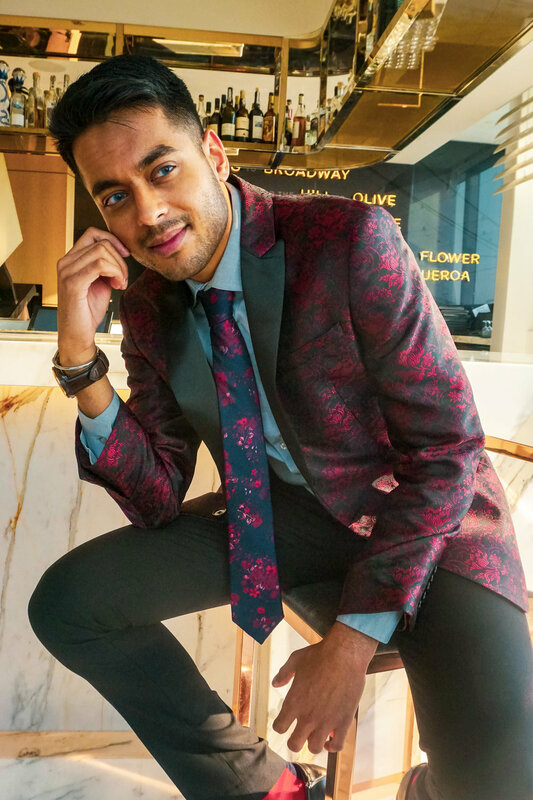 I fell in love with this floral jacquard tuxedo jacket. I loved revitalizing an accustomed spring-time pattern in November – I mean this is LA after all. Who is Winter? Not sure that I know her. The Holidays are magic. It’s time to celebrate! Currently, they’ve got the best holiday deals whether you’re looking to upgrade your closet with that stand-out outfit or get a gift for that special someone. Let’s get festive – access Express-mas special offers in partnership with #WhereIsNeel here. What are your Holiday plans? Tell me below!